GP Engineering (North West) Ltd carry out the design fabrication and installation of prefabricated packaged process & utility skid mounted pumping systems for industrial heating cooling & heat recovery. Each prefabricated modular skid is designed specifically for individual customers requirements across a wide range of applications. A prefabricated modular skid mounted package can be specified with variable speed drives, touch screen controls, valves, flow metres, pressure sensors, temperature sensors, air separator units all to integrate into existing site systems delivered and installed on site. The prefabricated packaged modular skid system below was designed to pump cooling water to machines at several locations around a factory passing through roof mounted chillers to keep the water a predetermined temperature. Once a packaged prefabricated modular process skid is delivered to site the installation time is greatly reduced with all wiring and pipework connected and tested before it leaves our workshop leaving only the site connections to be completed into existing pipework and electrical systems. 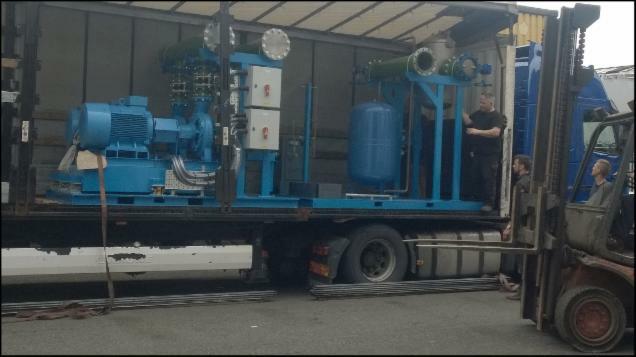 Transporting each skid mounted pumping system to its final destination is made easy by our work shop location with excellent links by road rail or sea. All prefabricated & skid mounted modules can be packaged up delivered and installed worldwide we have an experienced workforce who have carried out recent installations in Czech Republic, Finland, & India.